when we first found our house. as well as it's new look. it was just a little vacation cottage in the country. It was dilapidated, vandalized and neglected for over 50 years. It was beyond really bad. But there was something about it. I fell in love with the original details that were there. The knotty pine walls. The large fireplace. The old kitchen with original cupboards and hardwood floors. The gorgeous property that it sat in the middle of. I am an old house romantic. I was seeing potential- it just needed to be uncovered and polished up a bit. Okay, well maybe A LOT. if finding it for the first time now. and had 6 different tiles in it. Red, orange, brown, gold and brown spotted, white spotted with brown and plain white. a ceiling open to the roofline and basically a big. fat. mess. I had a vision for this crusty little space. I knew what I wanted it to look like. the backyard for lots of natural light. with bead board and 2x4 beams. placed a dainty commode from Ross in between the sinks for storage. and overseeing to make sure everything was up to code. checkerboard pattern for the floor. The ruffled shower curtain is a drape panel from Target. the tub faucet is now where the water heater is in this photo. The large beam runs across the door opening. size of the bathroom allowed for my Jacuzzi tub. and was a thrift find for $15. 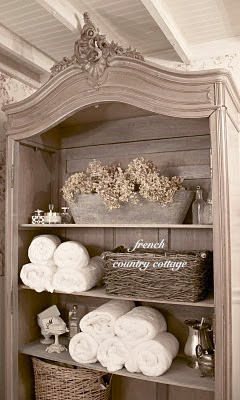 The French armoire is wonderful for storing everything. It's original pale grey finish is a favorite of mine. I took the doors off to use it as an open cupboard. and a little Puccini on my ipod. Courtney that is absolutely gorgeous!!! Everything about it! 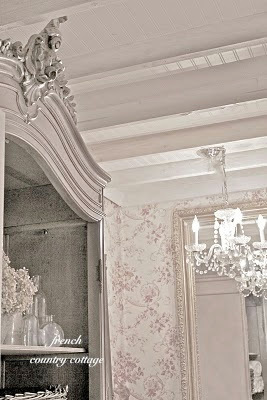 I love the ceilings and that armoire is so beautiful! Happy soaking and relaxing! WOW! I loooooove it! I am drawn to old houses too. New houses just don't have the same charm. You did an amazing job! Love the armoire idea with no doors. You have a beautiful bathroom ! Very inspiring ! Oh my goodness!!! 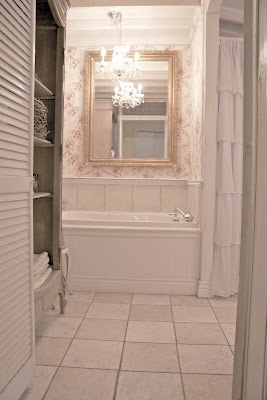 What a makeover...this bath HAS to be one of the most gorgeous I have ever seen!!! LOVE it...everything in it says....relax! Beautiful job! I am dying to know about the wallpaper..its tooo gorgeous!! It is absolutely GORGEOUS!! Thanks for sharing. What an amazing makeover and an absolutely gorgeous bathroom! I love it! 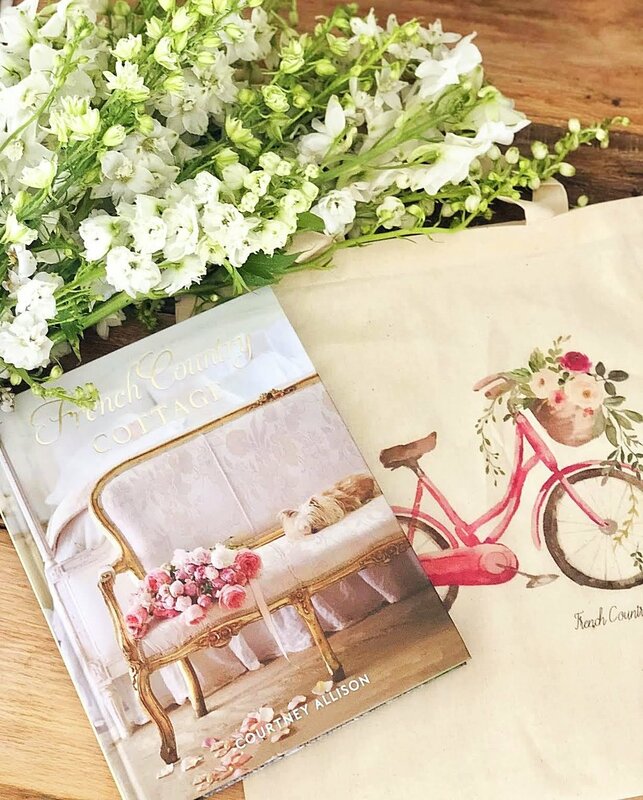 When it comes to creativity and decorating, people like you are my idols! I wish I could take some long hot baths in that bathroom too! :) So pretty!!! Courtney, what a beautiful retreat you have created!. It's simply gorgeous! I can relate. It is hard to believe those are the same rooms. What a mess and what a beautiful make over. You have worked and done your self prod. It belongs in a magazine. Thanks for sharing, Richard from My Old Historic House. Wow! It's pure eye candy. You do amazing work! I fell in love the first time I saw this bathroom. I am thinking the cupboard is a new addition?? I am gaga over it!!! Soooo fantastic! That is one beautiful bathroom! What a gorgeous bathroom! You should be so proud of all of your work. I LOVE the armoire. It makes such a statement in the bath! And the chandelier is absolutely stunning! Very pretty! Courtney, Your bathroom is one of my absolute favorites! 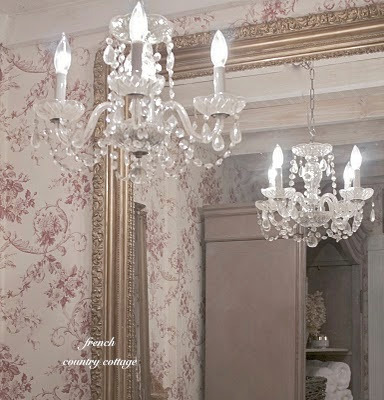 I love the armoire, the chandelier and the pretty mirrors. Everything is gorgeous! It's hard to imagine the humble beginnings of this room. Congrats on creating such a beautiful bath and thanks for sharing at the Open House party. Such a gorgeous and elegant room! Love the soft colours, the armoire, your tile choice....just a great room. Awesome remodel. I admire that you worked around the details of the house. It looks fantastic. Beautifully done! Now my projects don't seem so big after seeing what you accomplished. LOVE!! You gave me a lot of inspiration for my own remodel...it's gorgeous!! Gorgeous! Just yesterday I popped by your blog and saw this first posted in 2010. Beautiful then and I love the changes you've made again! I just love every little detail. How fun to take baths there. It is truly a bathroom of bathrooms a perfect place to soak and dream! What a room to love! Courtney, I did not realize your home was so old. I love what you did in the bathroom. Love the beams, wallpaper, armoire, well, love it all. Wow! That is so beautiful! I wish I could pick my favorite thing, but there are just so many! I love the armoir, and the way you styled it. 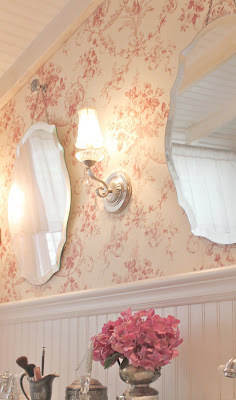 The beveled mirrors are gorgeous- I love their shape. And oddly enough, I noticed your makeup brushes in the littler silver pitcher- I just love how that looks! Your bathroom is truly breathtaking! Pretty gorgeous! Apart from the new space you created, you did a beautiful job on the decorating! The wallpaper does so much magic, and the French cabinet, and chandy does the rest! Perfect! Simply stunning! 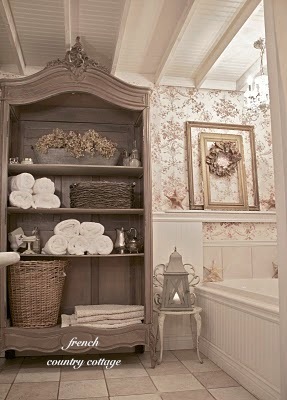 Love the beadboard, wallpaper, armoire, chandy. Love it all! Courtney I adore your armoire, I wish a had a bath large enough to fit one! It is all beautiful! I'm recently looking for some idea of bathroom I like, 'cause I'll have to redo mine. Love your armoire and all the little details. Wow, It is really one of the most beautiful bathrooms that I have seen! Colors are stunning! Your blood, sweat and tears have paid off. It's very lovely. Fab! When can I come over to "borrow" your tub long enough for a bubble bath and maybe some chapagne and insanely expensive chocolate? Love it, love it, LOVE IT!!! That is one amazing transformation. I think my favorite part is the wallpaper. Or maybe the picture frames. Or the armoire. OK, I love it all. It's so beautiful it's making me cry! What a wonderful place to bath and relax. Courtney your bath is breathtaking! I've always envied those who's baths are large enough to fit furniture in. 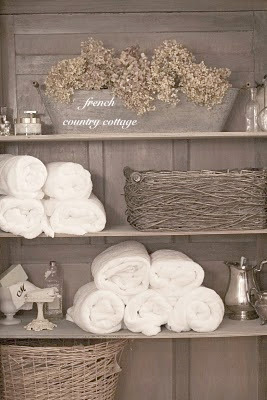 I love the large French shelf and the wonderful toile wall paper. Everything really, how amazing the transformation is. I am not sure if somebody can fall in love with a bathroom or not... but I just did!! It is gorgeous. I liked that open armoire so much that I pinned a picture of it. French & Fabulous! The grey you selected for the armoire is drop dead gorgeous. Pretty always works and this works well. Smart idea placing the chest between the two pedestal sinks! Really nice. 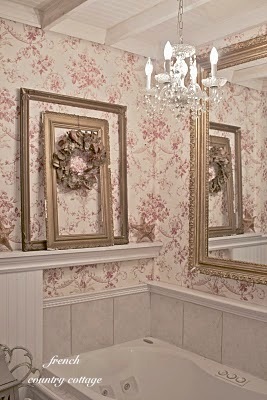 My gosh Courtney your bathroom is beautiful! It sure did not start out that way. You did an amazing transformation. Love those mirrors! That is my dream bathroom! I love every single thing about it!! Best wishes and thanks for the inspiration. I just adore your beautiful bathroom! It's the exact style that I love. You did an amazing job with it. The armoire is my favorite feature I believe. I'm popping by from White Wednesday! Gorgeous Courtney!! I could spend all day in there! So, so beautiful! I am glad you shared it again, because I did not see it the first time around and would have been so sad to have missed seeing this stunning bathroom retreat! All of the details are just perfect. No wonder you love it so much! Omg sooo sooo pretty!!! Not only is it beautiful but it looks so relaxing. Great Job!! I love an old house too. Your bathroom is just stunning. It's so beautiful.....love the old house too!! What a beautiful room! I love your creative vision brought to life-so inspiring. HI Courtney, your bathroom is gorgeous! I love everything about i! You did a great job designing it to what you wanted. Your bathroom is beyond gorgeous! I remember reading about your cottage and seeing the transformation and was totally amazed by it at the time. You really brought it to beautful life. $15 for the chandelier??? Where is this Thrift Store LOL. You've done an amazing job. Love everything about it.... beautiful armoir.... removing the doors was billiant. I found you through Nifty Thrifty Tuesday. Thanks for sharing. Courtney, I can hear the house thanking you for loving her. You've done a magnificent job. That really is stunning. The chandelier is amazing. I love each and everything you have done. Thanks so much for sharing it at DIYbyDesign. 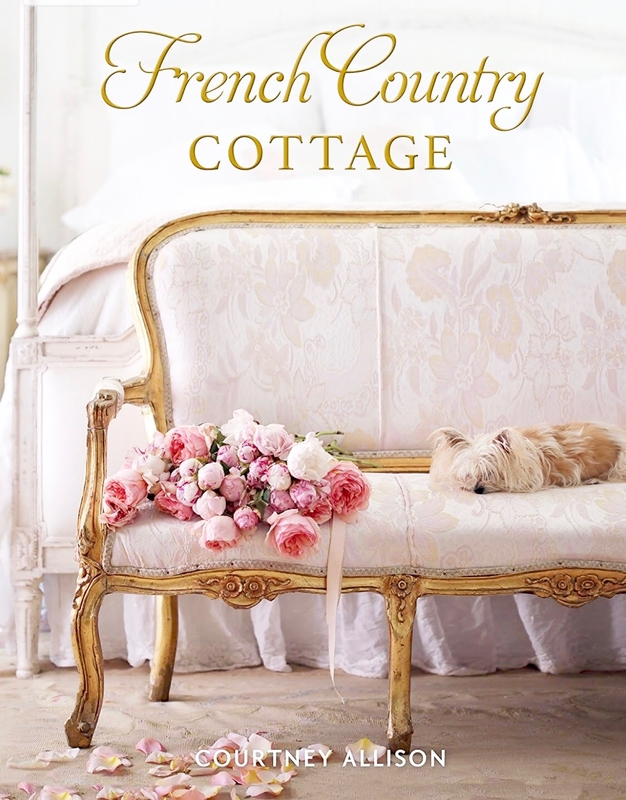 You had me at French Cottage. It is so pretty. I want that armoire! I just love it all! Courtney, I love this remodeled Bathroom. So fabulous, french country. 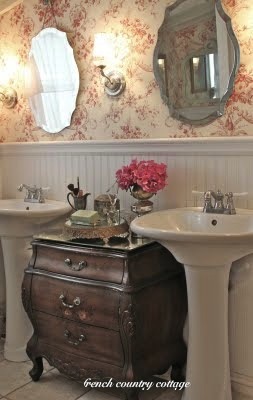 I really liked how you placed the small chest between the sinks, great idea for storage as well as adding interest. 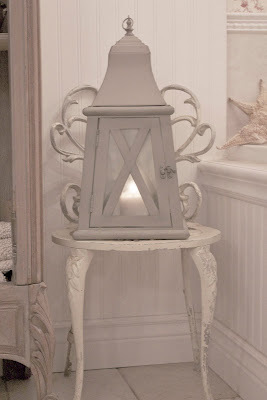 So pretty, I also love the Armoire, great upcycled project. I have pinned some photos, to good not to share! 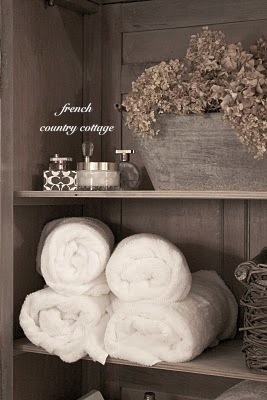 Courtney, I love how beautiful your bathroom turned out.Fabulous Country French. I especially love the way you placed the small chest between the sinks. A beautiful way to add storage. 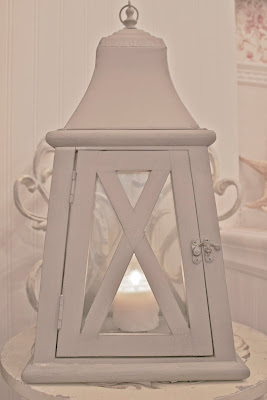 I also love the upcycled French armoire, perfect color, it looks absolutely right for storage in this great makeover. I can relate to all the hard work when you buy an old home and renovate, but I agree it is worth saving the old homes that have such good bones. I had to share some photos on my pinterest boards, too pretty not to share. Your armoire is the prettiest piece of furniture I have ever seen! Ever! I hope you gave your husband lots of kisses for bringing that beauty home! Your whole bathroom is gorgeous and stunning and really, really, should be in a magazine! This is so beautiful. I just had to feature today on Mod Mix Monday! Ooh! I love that furniture piece. I loved the other one too but this one has such beautiful detail and the color is PERFECT for that room. 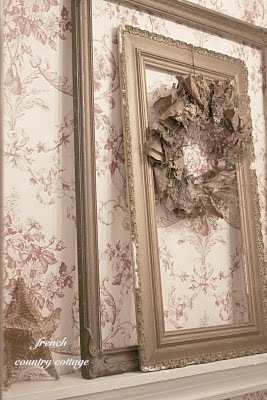 I adore the sweet simplicity of the open frames & wreath too. I didn't think it was even possible to improve on the original post but by golly, you did! I'm just gonna send you my floor plan & pics and you can just decorate everything for me, k? hehe! Such a beautiful bathroom. You did an amazing job in there!! So incredible. I will be featuring it tonight at my Fall into Fall party. Please stop by and pick up an I've Been Featured button. Thanks so much. The linky opens at 8pm EST tonight. THIS IS SO IMPRESSIVE! I AM IN LOVE WITH YOUR BATHROOM! THANK YOU FOR YOUR DETAILED INSTRUCTIONS. I AM YOUR NEW FOLLOWER BY THE WAY! Gorgeous transformation! Love your blog! Your bathroom is an amazing transformation!!! All I can say is you have (or once had) courage to take this on, but I bet every time you see the end result you're glad you did it. It looks great! Oh I love your bathroom, what a great job! it's beautiful love the details and the wallpaper is sooo pretty, I'm just finishing a bathroom remodel of my own and I'm very tempted to do some wallpaper in there after seeing yours. Just gorgeous!! What a great job you have done!! Who would have ever thought that the previous bathroom could have looked like that!! Great foresight and wonderful decorating. I just found your site and became a follower!! I am about to TRY to paint my bathroom vanity. Could you tell me what you did to your armoire. I can only hope my bathroom will turn out half as fantastic as yours. breathtaking ! 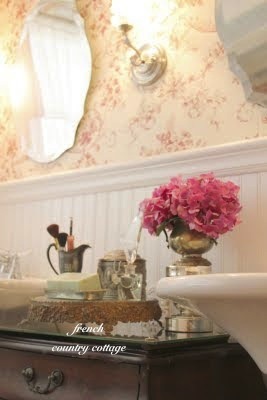 i`ve always dreamed about such bathroom..
Wow, its so fancy and pretty!! love it! Thanks so much for linking up and linking back to us. Good luck and feel free to follow us on facebook for all the contest updates! 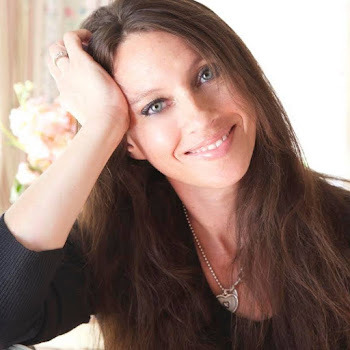 Today,I first time be on your blog.You are so CREATIV!BEAUTIFUL!BEAUTIFUL!Thanks! Oh my Heaven! Absolutely Stunning!! So much hard work, but it turned out gorgeous~~ Thank you for sharing and inspiring !! Theresa! Stunning. Can you share the armoire color? I love your style. 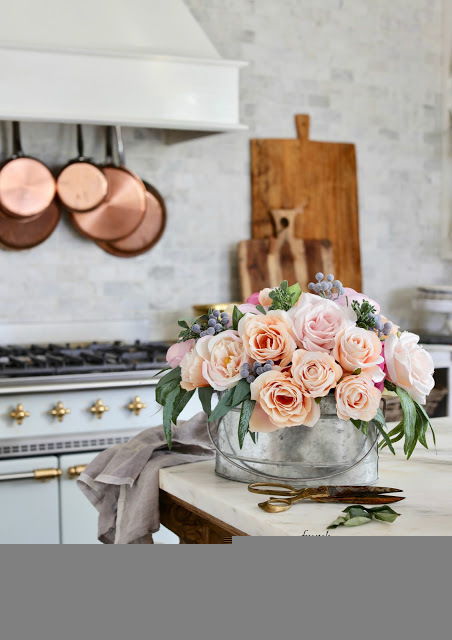 I am remodeling my kitchen and my bath after yours I love this site too fantastic!! Sooooo awesome! I LOVE a good before and after! Especially when it comes to room renovations and when the before is really bad! This is very beautiful, I absolutely love the wallpaper! I love this! I've seen one of these pictures floating around pinterest and have it pinned on my board. This is such a gorgeous bathroom! Love French Toile de jouy. Awesome bathroom remodeling design ideas for small bathroom remodeling with nice pictures! Thanks for giving such a great ideas. This is such a beautiful bathroom remodeling. In Colorado Springs CO, my son remodeled his bathroom recently and it looks so good! Such a nice change, his is a little more modern but I like this. Thanks for sharing! Just amazing and beautiful. Did you paint the armoire? I love the color. What color or stain did you use on your armoire? Its just beautiful!